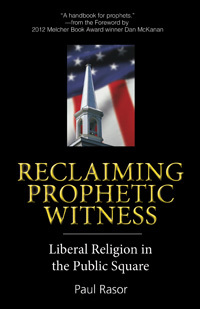 The discussion guide for the 2014-2015 UUA Common Read, Reclaiming Prophetic Witness: Liberal Religion in the Public Square by Paul Rasor, is available now to download for free. The discussion guide is offered in two formats: a single, 90-minute session or three, 90-minute sessions. In addition to offering a framework for exploring and testing Rasor’s ideas, this discussion guide suggests books and resources to help apply his insights to specific social justice issues-which may include ones nearest to your heart or to your congregation’s justice ministry. Reclaiming Prophetic Witness, published by Skinner House, points out a growing misconception that conservative Christianity is the only valid religious voice in our national social policy. The book includes insights from our liberal religious theological heritage, and calls us to prophetic, faith-based justice work. Rasor explores the forces and tensions that have weakened our prophetic witness in the last quarter century. He also makes a strong case for the necessity of a liberal religious presence in the public square to complement and strengthen secular voices raised for social justice. Purchase your copy of Reclaiming Prophetic Witness today. Buy in bulk and save: bulk orders of 5 to 9 copies receive an automatic 10% discount and orders of 10 or more receive an automatic 20% discount. We hope you will join Unitarian Universalists from all over in sharing this Common Read and in reclaiming the practice of prophetic witness. Why participate in the UUA Common Read? A Common Read invites participants to read and discuss the same book in a given period of time. A Common Read can build community in our congregations and our movement by giving diverse people a shared experience, shared language, and a basis for deep, meaningful conversations.